If you’re after an outfit that’s both cute and chic, you can’t go past a skirt. These simple yet seriously stylish bottoms add a lovely feminine aesthetic to any look and are perfect for every occasion. As versatile as they are fashionable, skirts can be worn for work, the weekend, a night out, and so much more. All you need to do is find your ideal skirt type and style it in an on-trend way for a gorgeous appearance. To help you nail your perfect look with this womenswear staple, we’ve curated a collection of inspiring cute skirt outfits that you’ll wear all year long. 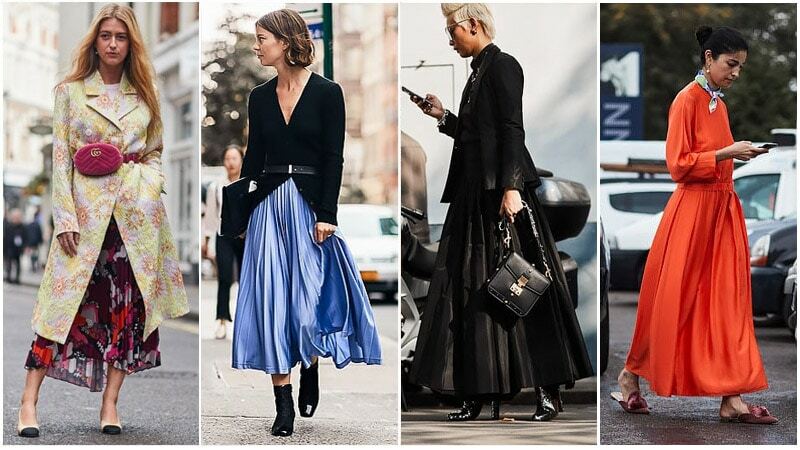 Maxi skirts have long been loved by ladies everywhere. Thanks to their length, these skirts work perfectly as statement styles, especially when featuring a bold pattern, print, colour or design. To rock the maxi skirt in 2017, just select a style in a lightweight fabric. Then, partner it with a knit or a structured jacket or coat for a stylish autumn or winter ensemble. If you are petite, you may want to wear heels to balance this full-coverage look. The midi is undoubtedly one of the most popular skirt styles of 2017. Finishing between the knee and the ankle, and highlighting the slimmest part of the leg, midi skirts are incredibly flattering on all body types. For an on-trend version of this look, select a pleated midi skirt in a metallic hue or bold pattern. This statement style can easily be worn on the weekend or to a fun evening event. If you’re ready to show off your legs, a miniskirt is what you need. Cute, stylish, and a little daring, miniskirts are ideal for creating gorgeous weekend or evening ensembles. They’re also versatile and can suit a wide variety of garments and accessories. For an on-trend look, you can partner a coloured mini skirt with a slogan tee, check blazer, and a pair of sock booties. The result will be an incredibly fashionable look that’s perfect for brunch, the bar, and everything in between. 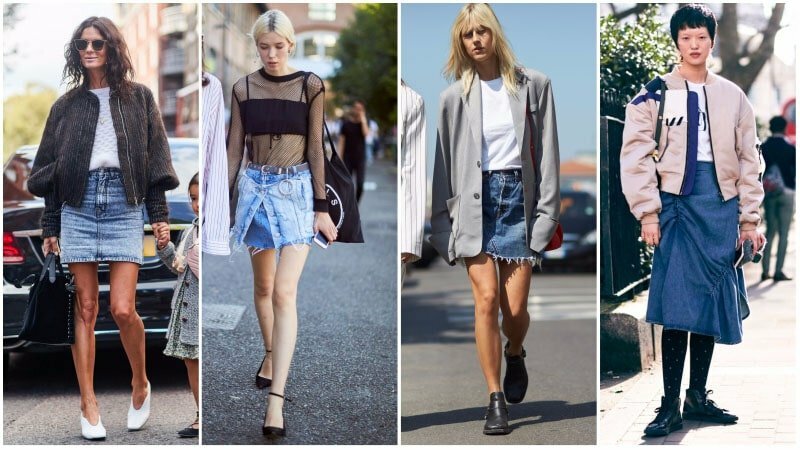 With the return of ’90s fashion still booming, it’s no surprise that the denim skirt is popping up everywhere once again. Whether worn as a mini, A-line, pencil or midi, denim skirts are incredibly popular right now. To nail the look for yourself, select a distressed style and pair it with an oversized bomber jacket or blazer. The edgy yet chic ensemble is perfect for casual spring days and weekend errands. Perfect for adding a subtle dose of attitude to any outfit, a leather skirt is a modern-day must-have. As chic as they are bold, these bottoms look great with a range of tops and can be worn anywhere from the street to the bar. Thanks to their heavy-duty fabrication, leather skirts are especially ideal for autumn and winter. Thanks to their versatility, skirts can either be worn casually or in a more glamorous manner. If you’re after a style that will suit cocktail functions and evening outings, look no further than the sequin skirt. This glitzy style has some serious shine power and is sure to turn heads. If you’re worried about your outfit appearing too intense, just pair your sequin skirt with a casual top, such as a t-shirt or sweater. 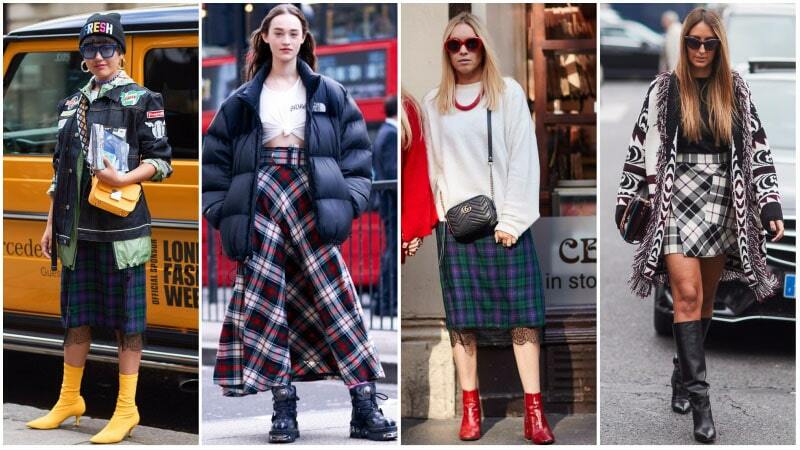 Plaid and tartan are back and have been spotted on the stylish streets of London and Paris. Once ’90s grunge staples, these iconic patterns are on-trend again. To wear the look for yourself, try investing in a chic plaid skirt. Select one with an overall dark hue and pair it with autumn essentials, such as a long cardigan and ankle boots. If you want to wear a skirt to the office, you can’t go past a pencil skirt. The chic and sophisticated style is always fashionable and works perfectly in a business setting. Just remember to select a design in a thick fabric for a more structured and formal appearance. Alternatively, if you want a pencil skirt that suits evening functions, choose one with a tight fit and plenty of stretch to show off your feminine curves. Fun and flirty, skater skirts are ideal for achieving a feminine and cute look. The versatile style can also be paired with a wide selection of items and worn for many occasions. To wear a skater skirt to work, just partner it with a button-up blouse or sweater and low heels. To wear it on the street, try a t-shirt and ankle boots. If you’re off to a party, on the other hand, a crop top and high heels create the perfect outfit. 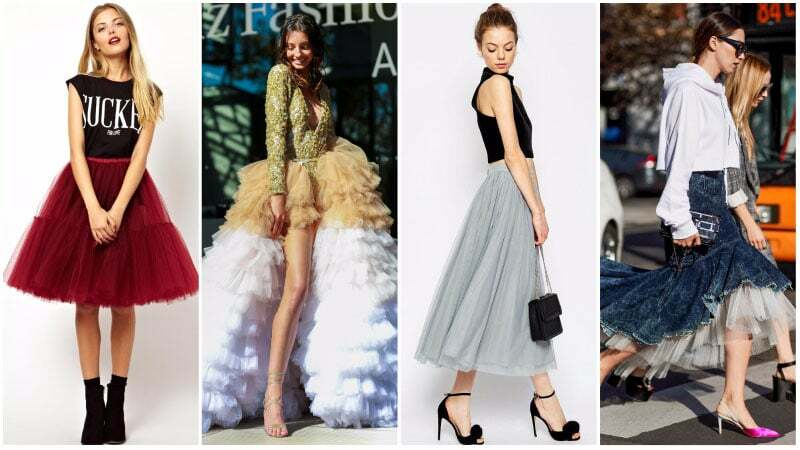 Although the style isn’t as common as others, a tulle skirt can make an excellent addition to your wardrobe. This feminine design is perfect for creating a delicate and beautiful appearance for formal occasions, such as weddings or proms. However, they can also partner superbly with streetwear for an edgy and attitude-heavy look. To nail this modern combination, all you need to do is partner a tulle skirt with a black t-shirt, cropped hoodie, and kitten heels. Don’t get stuck thinking that skirts are just for summer. These versatile bottoms can work for every season, including winter. 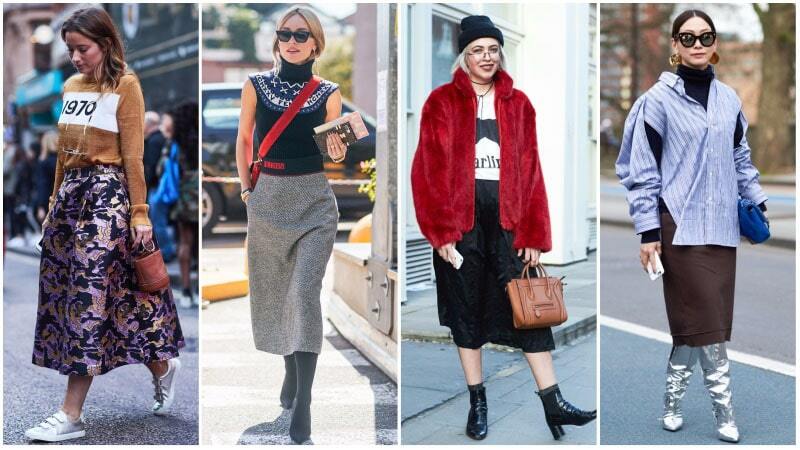 To ensure you aren’t left freezing, you just need to know how to style your skirt to stay warm. Start by selecting a long style, such as a midi, in a thick fabric, such as a knitted wool. Then, partner it with warm winter essentials, such as a turtleneck sweater and faux fur coat. To complete your winter skirt look, just add over-the-knee boots to help ensure your legs stay toasty. Skirts make keeping cool in summer a breeze. All you need to do is select the right style, and you’ll soon be loving the heat instead of cursing it. 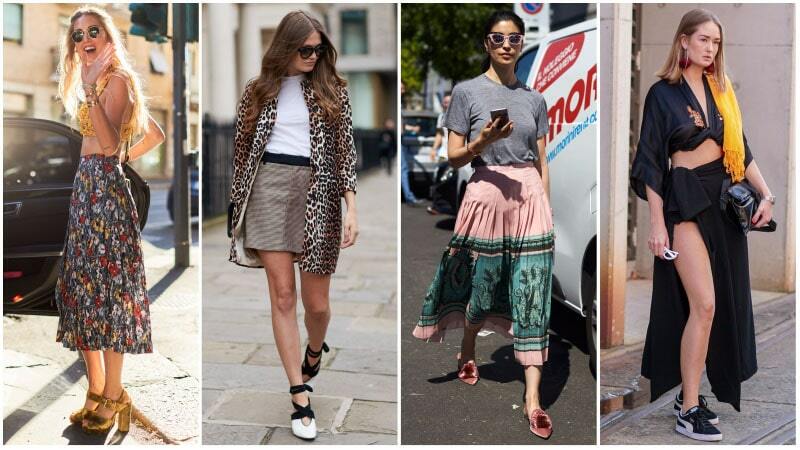 Miniskirts are of course an excellent option for hot weather, but midi skirts can also be great. A lightweight midi in a fun print is perfect for sunny days spent outside. Thanks to its long length, the midi can also be paired with a short crop top without leaving you overexposed.